Warrior Forge 2012 has come to an end. In this video Cadets and cadre share advice in order to aid future Cadets in excelling while at the Leader Development and Assessment Course. Congratulations for those who graduated and good luck! Compilation video of all that Cadets endure while completing the Leader Development and Assessment Course at Joint Base Lewis-McChord, Wash.
JOINT BASE LEWIS-McCHORD, Wash. – Following the Leader Development and Assessment Course (LDAC) a world of opportunities within the Army opens up to Cadets. At Branch Orientation, Cadets visit large Army tents set up in the middle of the regimental areas, rotating every 45 minutes at the sound of an air horn to explore four of their top branch choices. They listen to speakers, watch videos and read about what may lie ahead of them in the next few months should they be chosen for active duty. While many Cadets may not be assigned to their first few choices, it is still important that they learn about multiple branches. JOINT BASE LEWIS-MCCHORD, Wash. – While typical Cadets run, jump and work together through LDAC courses, ROTC nursing students put in IVs, give medication and work late-nights in the ER inside Madigan Army Medical Center on the other side of Joint Base Lewis-McChord. Many of these interns already completed LDAC or will do so after their time at the hospital. The 29-day Army Nurse Summer Training Program was once a mandatory activity for all ROTC nursing students, but is now optional and competitively selected. 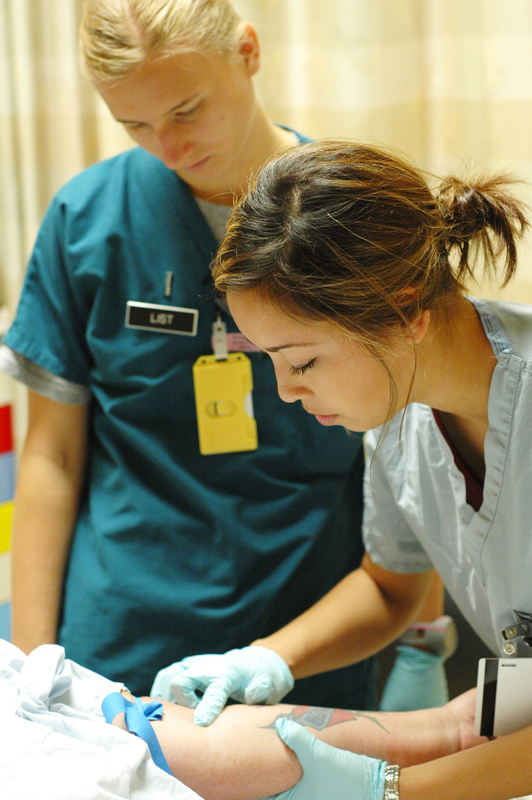 Nursing students apply for their top three choices of Army hospitals to work in. The two most requested locations are Landstuhl Regional Medical Center in Germany, which accepts the top 10 applicants, and the Tripler Army Medical Center in Hawaii, with room for three interns. 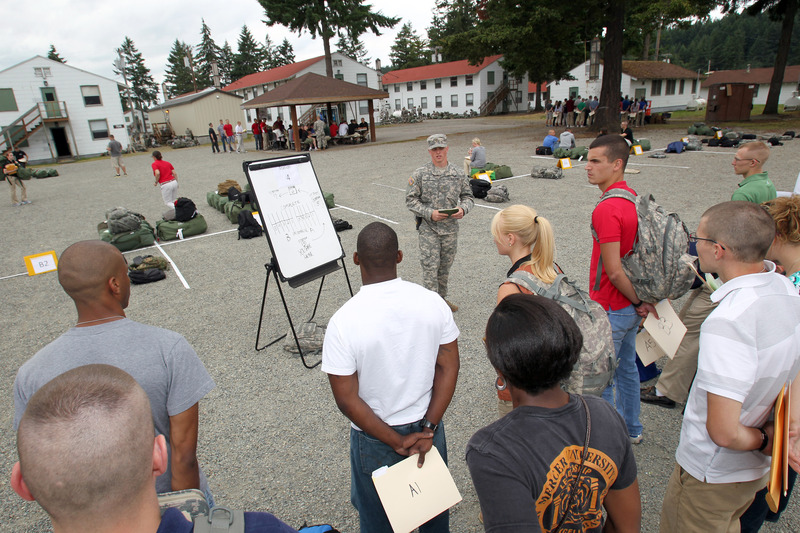 Applicants’ Army Physical Fitness Test scores and grade-point average account for 40 percent of their application score during the review process. Only those with the highest scores in these two areas will be given their top choice. 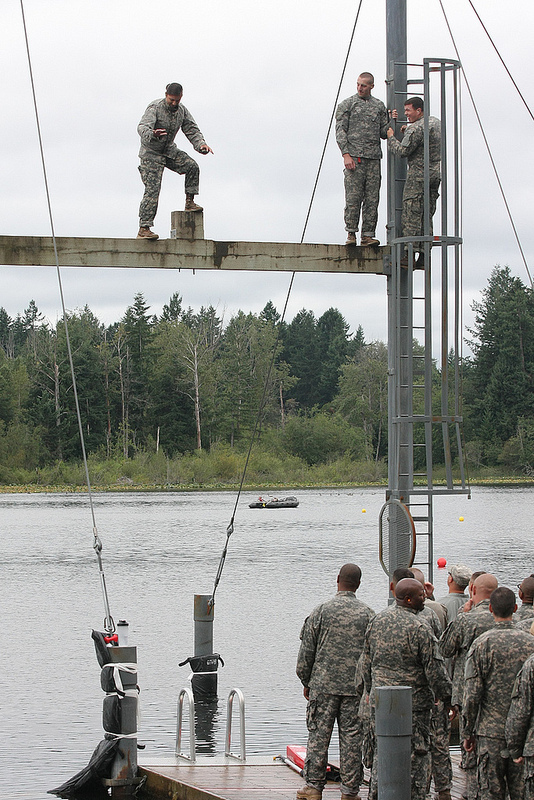 JOINT BASE LEWIS-McCHORD, Wash. – Thirty-five feet above the dark lake, a Cadet balances precariously on a 6-inch-wide beam by holding her arms out from her sides. As she steps gingerly down from a small block set in the center of the beam, she stumbles forward, falling to one knee. Her comrades below gasp as she grabs the ladder on the opposite side of the beam to avoid falling further. The Cadet bows her head and makes the sign of a cross before flashing a smile to the cheering crowd below. Slowly she ascends the ladder to the next challenge. The water confidence course at the Leader Development and Assessment Course (LDAC) marks the final test before Cadets graduate. Retired 1st Sgt. 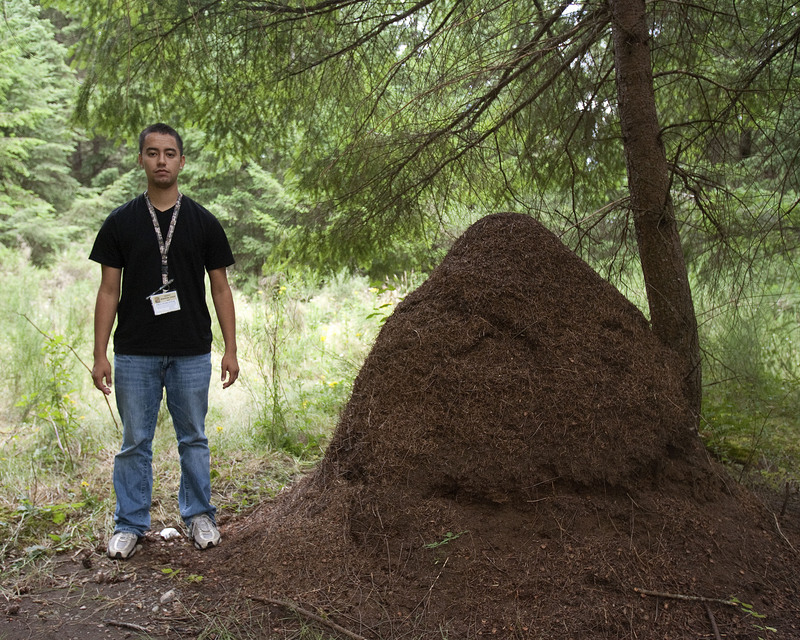 Jorge Rivera is a member of the cadre overseeing this site, which has one important goal. “The purpose of this course is to test Cadets’ personal courage and ability to overcome their fear of water, heights or both,” Rivera said. “Two of the activities here must be passed to graduate from LDAC, so a small percentage finds this site stressful because of their fears. JOINT BASE LEWIS-McCHORD, Wash. – The sun plays peek-a-boo over the horizon as Cadets gear up at the regimental assembly area for the culminating event of their tactics training, the 10k foot march. Prepared and ready to go, anxious Cadets get a head start on their 5:30 start time and step off at 5:20 a.m.
Company Tactical Officer, Lt. Col. Stacy Seaworth, who will lead the company of Cadets from beginning to end, directs Alpha Company off the line first. Though the march is not a timed event, most regiments finish in under two hours, said Mr. Steven Lopez, the tactics committee operations officer in charge of the march. JOINT BASE LEWIS-McCHORD, Wash. – Stress is a part of life but in the Army Soldiers are expected to perform to standard in spite of it. As Cadets, the most stressful situation they face is the Leader Development and Assessment Course (LDAC) held at Joint Base Lewis-McChord. 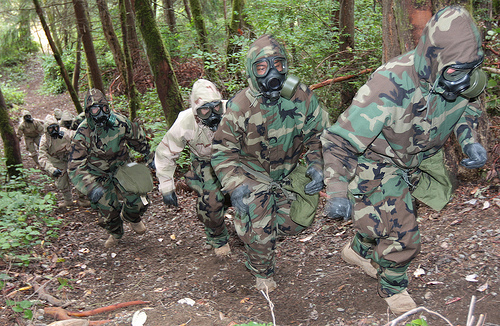 JOINT BASE LEWIS-McCHORD, Wash. – Infiltrating the enemy and obtaining intel are just two skills that Cadets master during tactics training at the Leader Development and Assessment Course (LDAC). 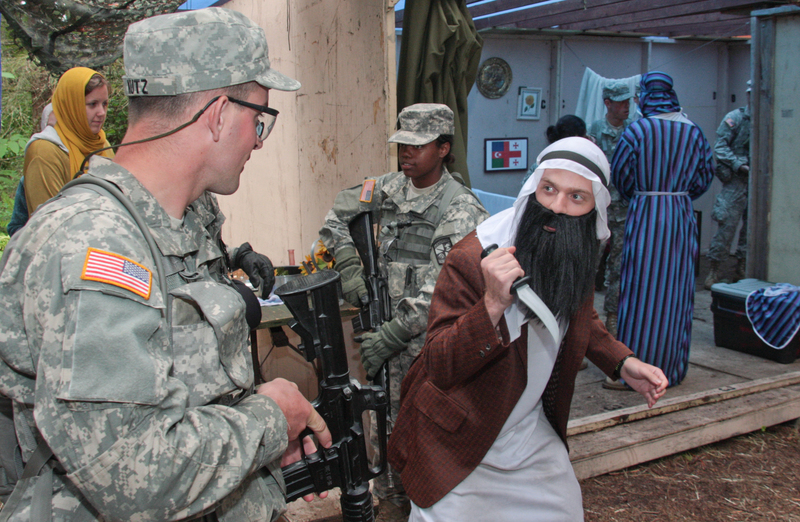 In the days leading up to training, Cadets spend hours learning how to interact with the people of Atropia during their Cultural Awareness training. Atropia is a fictitious country, primarily Spanish speaking, that is meant to resemble culture in the Middle East and Southwest Asian countries. Seventh Regiment Cadets capture Col. Manuel Dehoya, played by Sgt. Jeff Berger, during patrolling (PTRL) training on Lane 98 at Joint Base Lewis-McChord, Wash. U.S. Army photo by Jesse Beals. Understanding the kinds of environments they will be introduced to overseas helps Cadets to succeed while operating in those circumstances at LDAC. The land of Atropia is populated by Atropian civilians as well as the South Atropian People’s Army, SAPA, also known to Cadets as “the bad guys”. Cadets are taught how to complete their mission and extract the SAPA forces with the least amount of civilian disturbance as possible. This can be hard at times since SAPA forces can lay low and disguise themselves as civilians. Telling friendly civilians apart from enemy forces can at times be almost impossible. 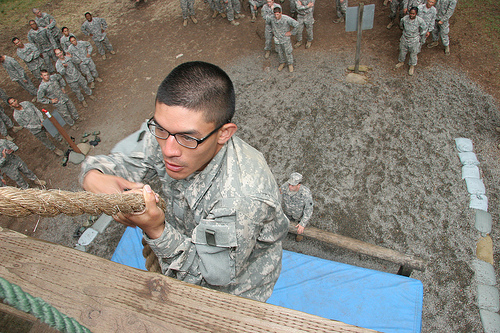 JOINT BASE LEWIS-McCHORD, Wash. – At the Field Leader’s Reaction Course (FLRC), Cadets encourage their squads to work together to cross obstacles. Portions of this course are marked off with red tape, which Cadets must avoid by going over and around using barrels, beams and other objects. 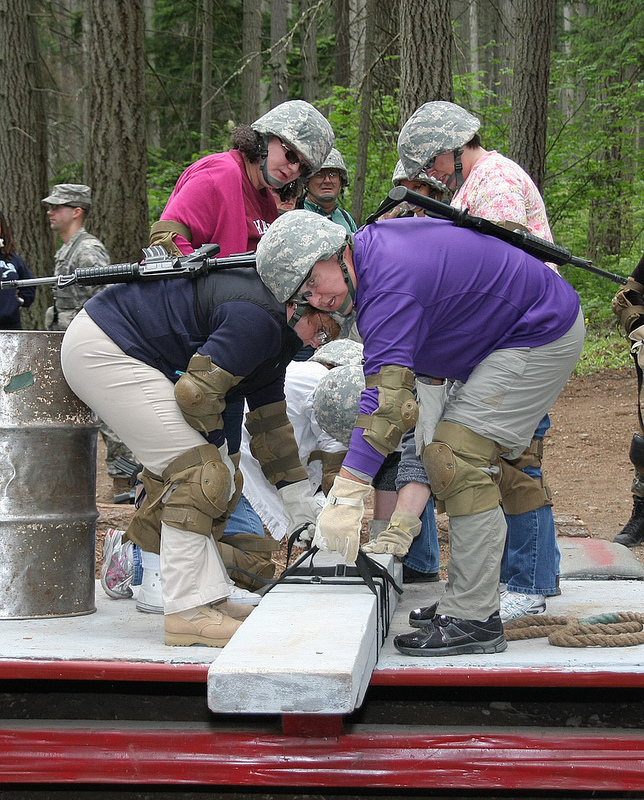 On an overcast day in the middle of a wooded area, a bright pink sweatshirt clashes with the green camouflage of a woman’s Kevlar as she helps several other brightly-dressed woman pick up a heavy wooden board. A grey-haired man stops rolling a barrel to rub the dull ache in his knee before he can continue. Those in T-shirts and jeans are not the Cadets generally being evaluated on this course; they are leaders and educators from around the country who are given a two-day tour of the Leader Development and Assessment Course (LDAC), which Cadets must successfully negotiate before becoming Army officers. 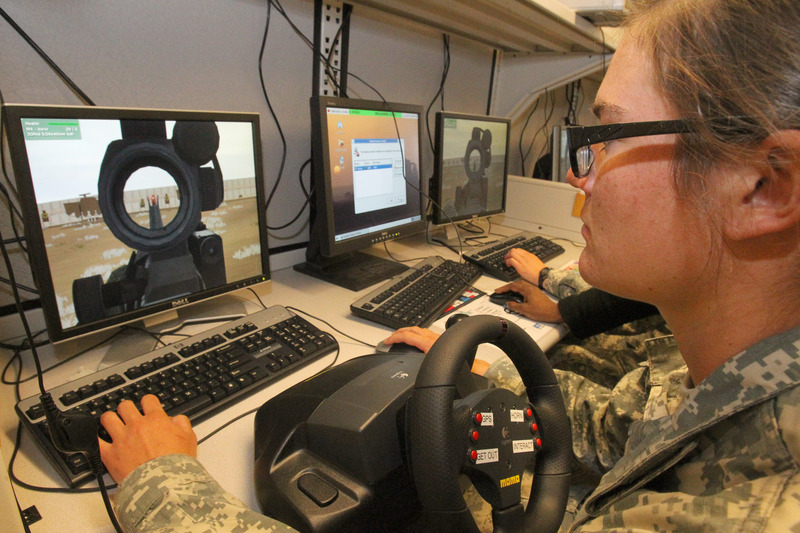 By gaining a glimpse into what Cadets go through to succeed in the military, these civilians gain a better understanding of what ROTC does to prepare their students for future leadership roles. These leaders and educators are encouraged to attempt any portion of the training – including the Water Confidence Course, First-Aid training and weapons familiarization. Warrior Forge Commandant of Cadets, Col. Dean Shultis, talks about the seriousness of cultural awareness at Joint Base Lewis-McChord. Warrior Forge Commandant of Cadets, Col. Dean Shultis, talks about managing risk and implementing safety during the Leader Development and Assessment Course at Joint Base Lewis-McChord, Wash.
Cadet Skylar Fairchild “sings” goodbye to the 4th Regiment to the tune of “American Pie” by Don McLean after their graduation ceremony from the Leader Development and Assessment Course at Joint Base Lewis-McChord. 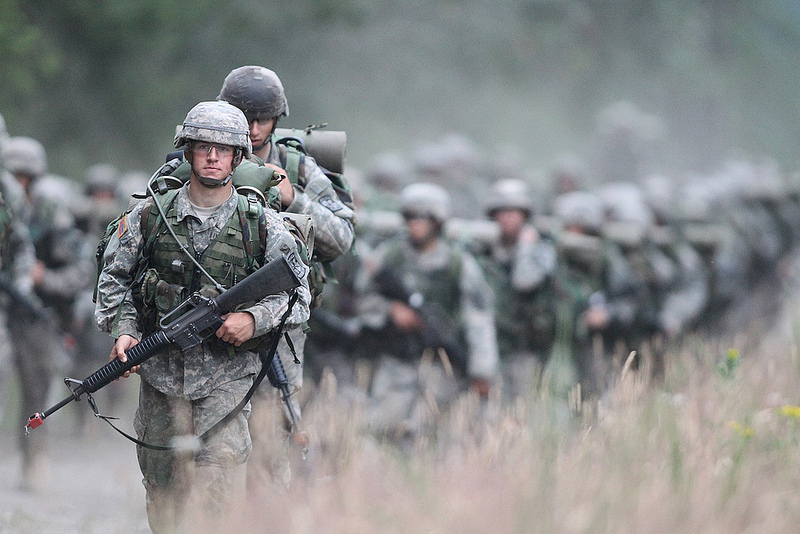 JOINT BASE LEWIS-McCHORD, Wash. – Intertwined with building Cadets’ confidence and camaraderie is an emphasis upon combat readiness. At the gas chambers, however, Cadets build confidence by experiencing the consequence of failure in their equipment. Warrior Forge Commandant of Cadets, Col. Dean Shultis, discusses the importance of logistics for mission success. JOINT BASE LEWIS-McCHORD – After running, climbing and strategizing their way through the many tests of the Leader Development and Assessment Course (LDAC), Cadets go to the Mission Training Complex to explore resources found on every Army post. 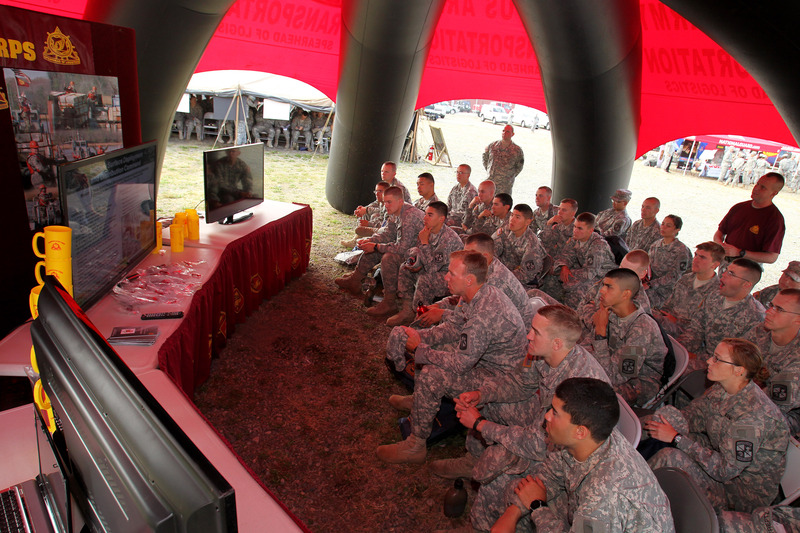 In an auditorium with stadium seating and a huge projection screen, Cadets watch a training movie. Further down the hall their peers stare at computer screens while negotiating pixilated vehicles through tough terrain. Others sit in large compartments surrounded by television screens to mimic conditions drivers of the Stryker armored vehicles face. 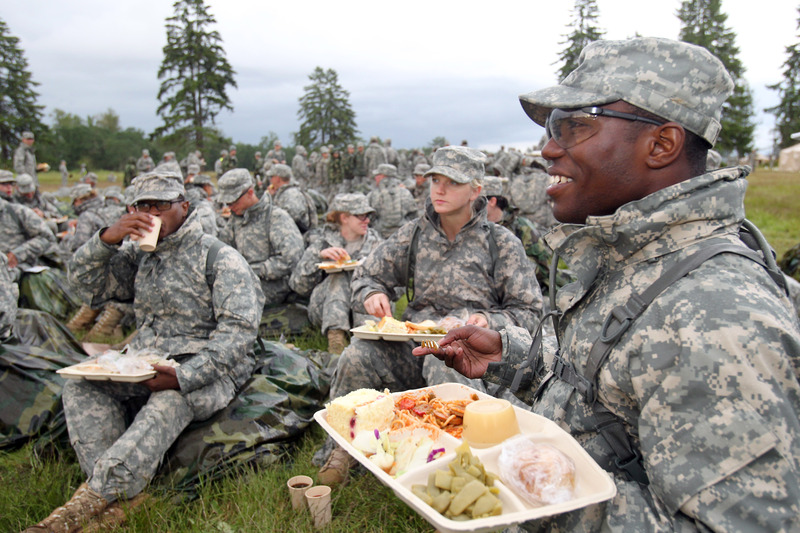 JOINT BASE LEWIS-McCHORD – Mama’s home cooking is hard to replace, but the food service staff at Warrior Forge keeps Cadets well fed during their 29-day challenge. “It’s a big process,” said Master Sgt. Stephen Och, head of food services at the Leader Development and Assessment Course. “There is a lot of preplanning that a lot of people do before this mission even kicks off because it is such a big event. Alone there are 6,500 Cadets,” explained Sgt. 1st Class Steve Szakal, also in charge of food services throughout Warrior Forge. JOINT BASE LEWIS-McCHORD – With the sun high above their heads, Cadets run around a large track as sweat pours down their focused faces. The Army Physical Fitness Test marks the first graded test of Cadets at the Leader Development and Assessment Course (LDAC). 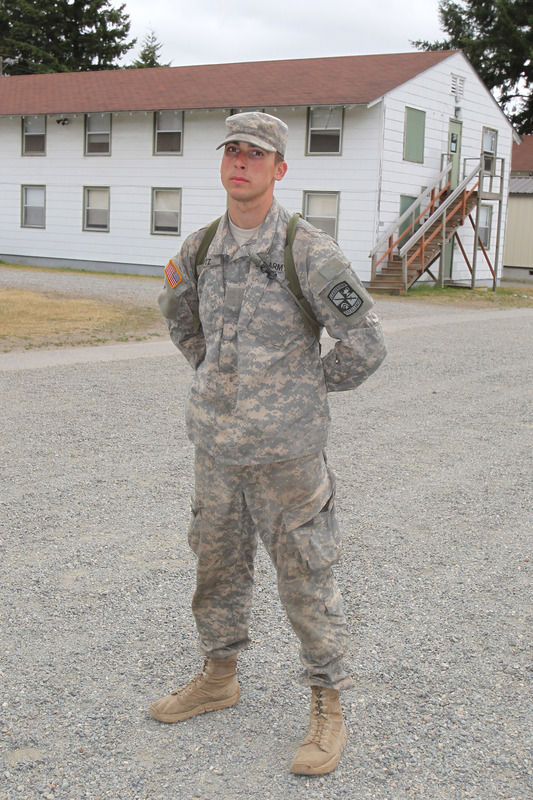 After years of conditioning for this course, Cadet William Wilson ran around the track for the APFT in the summer of 2011. The first test was going well for Wilson, until he felt a sharp pain. 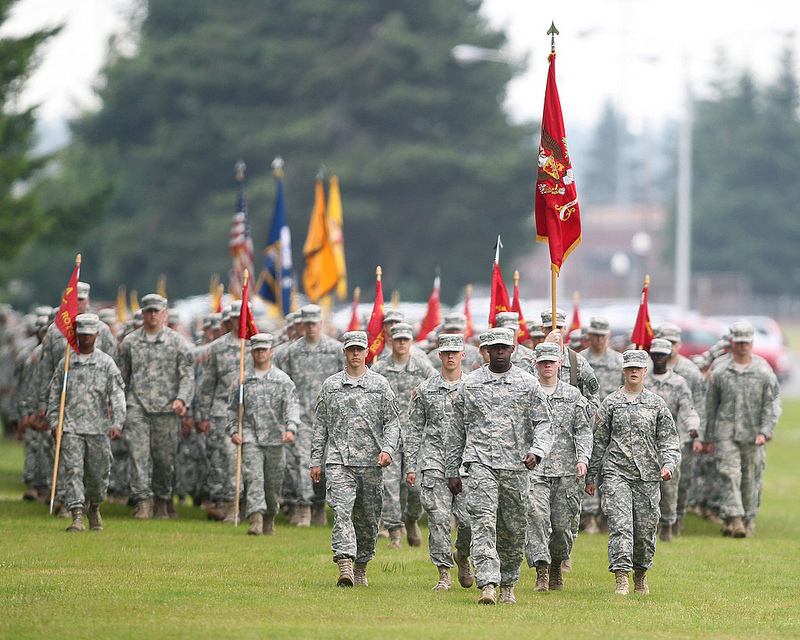 JOINT BASE LEWIS-McCHORD, Wash. – The 29 days of sweat, stress, camaraderie and leadership during the Leader Development and Assessment Course (LDAC) all boils down to one moment, graduation. LDAC graduates have been assessed on their leadership skills on land and water courses in all conditions and earned the right to continue their goal of becoming an Army Officer. Nearly 7,000 Cadets from 14 Regiments will graduate from LDAC, which is the greatest capstone assessment in an Army Cadet’s life. 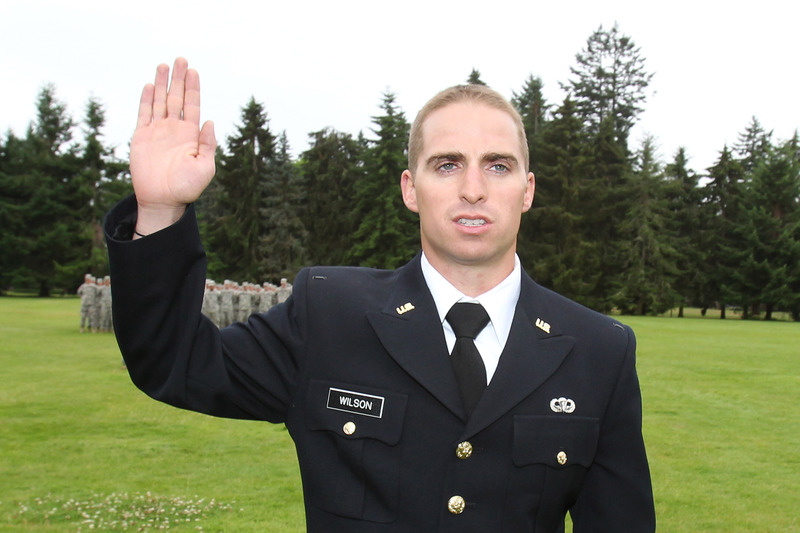 While the majority of graduates will return to their respective colleges or universities, others will immediately don the gold bars of a second lieutenant, having completed all their previous requirements. 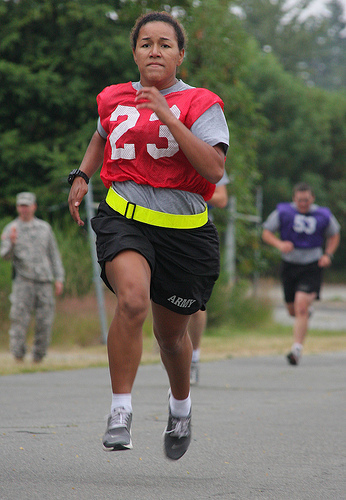 JOINT BASE LEWIS-MCCHORD, Wash. – Brigham Young University Cadet Eric Lowe scored a 367 on the Army Physical Fitness Test and Cadet Shanterra Scott from the University of Northern Iowa scored a 350, both earning the top scores for 14th Regiment.